JOMY has many years of experience in the design, engineering, production and installation of custom systems for safe access at heights. 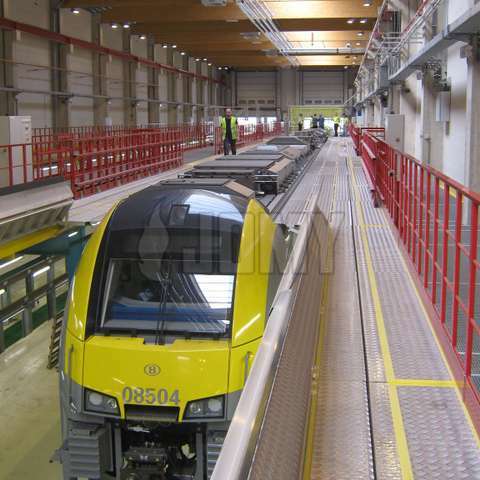 These access systems are used for the maintenance and inspection of trains, trucks and trailers, buses, and aircraft. These vehicles need to be repared and /or maintained high above groundlevel. 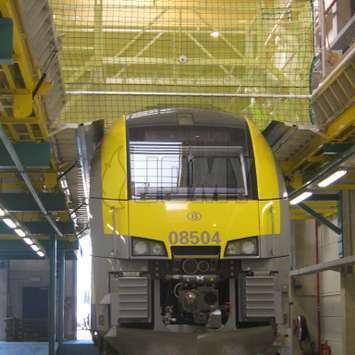 For example on buses, trucks and trains there is an increasing number of installations mounted on the roof. These installations need to be cleaned and maintained in a safe way. 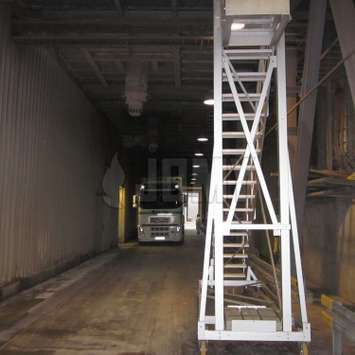 Another risky task is to control the loading of a truck. Too many times the driver mounts on the truck without any form of anti-fall protection. 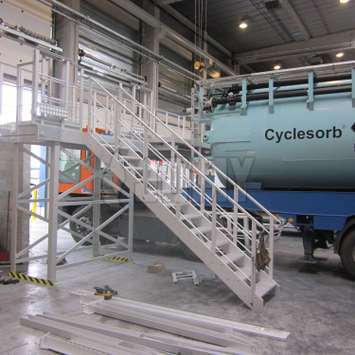 We can assist you in creating innovative solutions to contribute to active safety in your working environment. 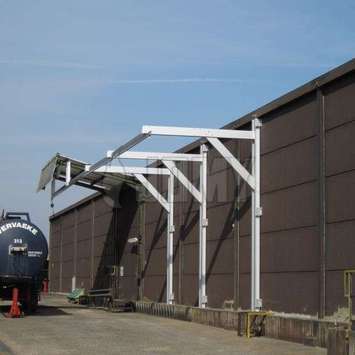 JOMY solutions for safe access to train roofs to do maintenance. 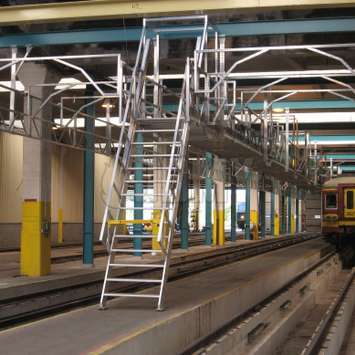 The roof of a train is filled with technical equipment, so it's necessary to have safe access to the roof. 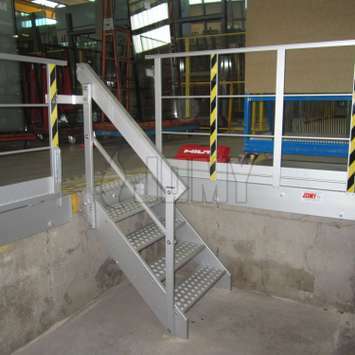 JOMY's engineers can develop safe aluminum constructions to facilitate and secure this safe access. 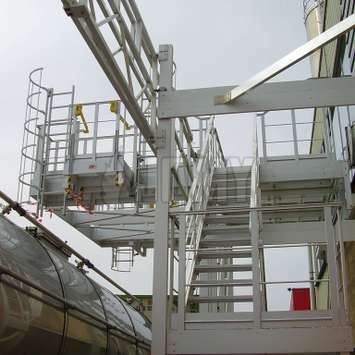 For the Belgian railways, JOMY developed and constructed several access systems, ensuring that maintenance and inspection of train rooftops can been accomplished without risking a fall. 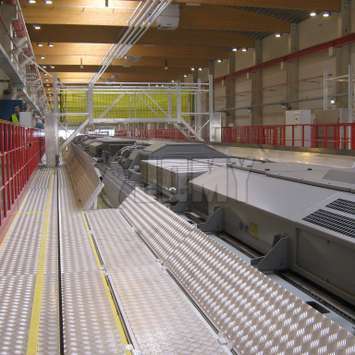 The JOMY systems are fully integrated with mechanical and electronic interlocks in addition to automatically operated walkways. It is now nearly impossible to abuse the system to create a dangerous situation. In these kind of projects, the strength of JOMY's first class engineers is evident. 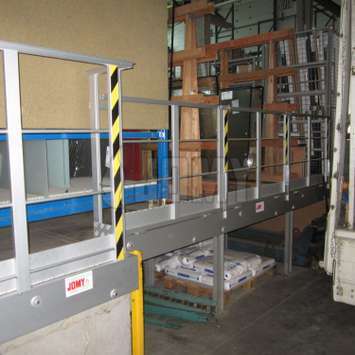 JOMY aluminum constructions ensure safe access to trucks and trailers for loading, unloading, and routine maintenance. Road trailers need to be loaded and unloaded, and this operation has its risks. 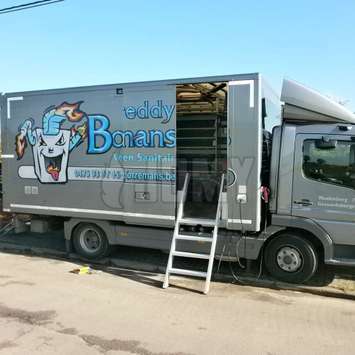 There is a high risk of falling when the doors are open or not filled by the trailer. This risk is drastically reduced by JOMY's movable guardrails. 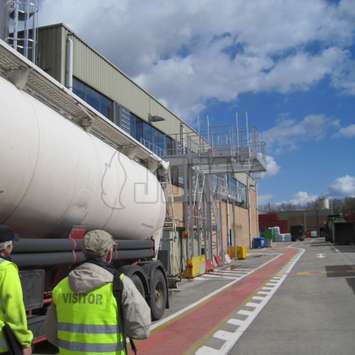 There are special trailers, used to transport liquids or powders, that need to be filled from the top of the trailer. 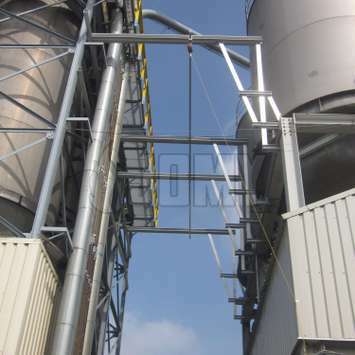 This is a dangerous situation, and anti-fall protection is needed. 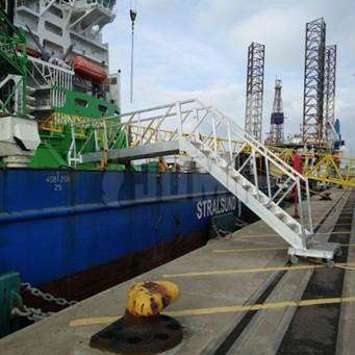 This is also a difficult task for the operators who are responsible for filling the trailer. 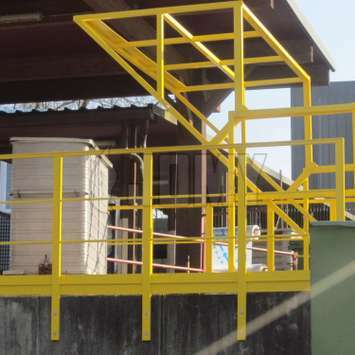 JOMY has mastered easy-to-use equipment and fall-protection technology. JOMY's easy to use and safe aluminum constructions are used to access bus and trucks rooftops to maintain and replace technical elements. Bus rooftops can be equipped with roof windows and air conditioning installations, and the rooftops also need to be cleaned and inspected. 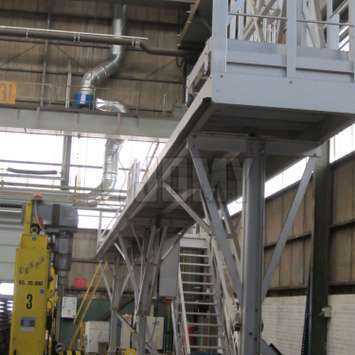 Rooftop access is needed in the workshops of bus companies. 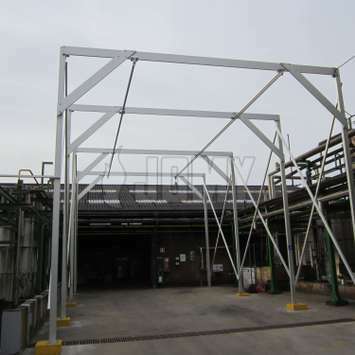 JOMY constructs custom made solutions that are permanent and those that are movable, all designed to reduce the risks associated with working at such heights while simplifying roof access. 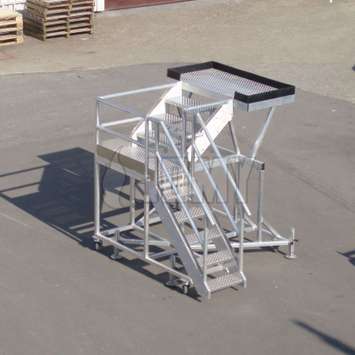 JOMY's lightweight, movable, and adjustable stepladders with platforms are used on airfields all around the world to access planes for inspection and maintenance. 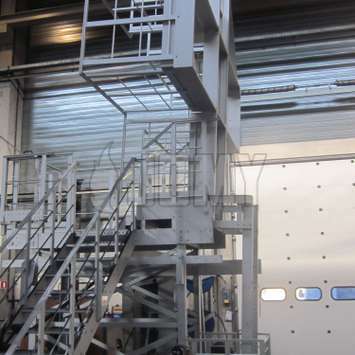 A variable height staircase facilitates access, inspection, and maintenance of planes and other machinery. 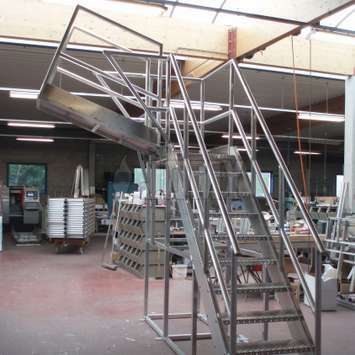 The staircase is composed of two parts: a fixed flight that keeps its pinned position on the floor and a variable platform that can be adjusted to the preferred angle.